The US House of Representatives this morning endorsed the policy of indefinite detention without trial of terrorist suspects, including US citizens seized on American soil, by failing to pass an amendment that would halt the practice. The final vote to defeat the amendment — part of the 2012 National Defense Authorization ACt (NDAA) — was 182-237. 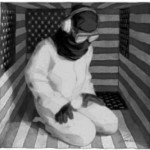 GTMO representation by Zina Saunder.